If your carÃÂ¢Ã¯Â¿Â½Ã¯Â¿Â½s Check Engine Light is on, you need this device. 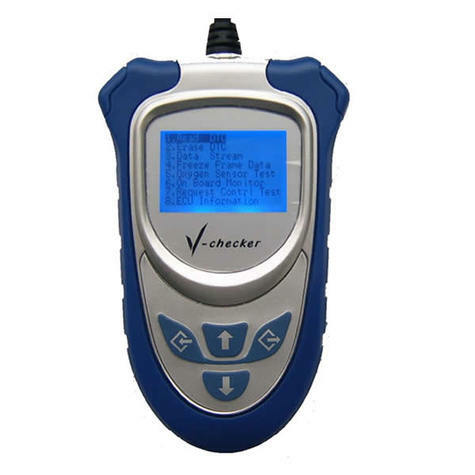 V-Checker is a handy device for reading and erasing trouble code in your vehicles. It can also display live data for your vehicle. It is small in size, robust in design, competitive in price and easy to use. This is a stand alone unit, it does not need a laptop computer to operate. By simply connecting V-Checker with the diagnostic socket, the user will be able to read the trouble code. The trouble code description will be displayed directly on the screen, no need for search it in the userÃÂ¢Ã¯Â¿Â½Ã¯Â¿Â½s manual. Each code will be continuously displayed until the [PREVIOUS] or [NEXT] key is pressed. This is a important advantage to compare with the old type trouble code reading tools. Even if you donÃÂ¢Ã¯Â¿Â½Ã¯Â¿Â½t repair the vehicle yourself, knowing the Diagnostic Trouble Code number before taking the vehicle in for repair the less likely you will be ripped off. Once the vehicle is repaired, the Diagnostic Trouble Code(s) can be erased and the Check Engine light extinguished using this scan tool. Another highly useful application for the scan tool is purchasing used vehicles. Used vehicles can have all sorts of expensive mechanical or electrical problems. Since our scanner is a portable device, the buyer, can connect the scan tool to the vehicle and in a few seconds determine if the vehicle has detected a problem. Remember, not all Diagnostic Trouble Codes illuminate the Check Engine light and a scan tool are the only way to obtain the information. While the parameters, or readings, required by OBD II regulations are uniform, the auto manufacturers had some latitude in the communications protocol they used to transmit those readings to scanners. Naturally, each felt they had the one true way, so I have three different OBD II communications protocols in use. The big scanner consoles costing thousands of dollars include the decoding software and firmware for all three protocols in their units, making them universal. Less expensive units, for home or small shop use, are usually customized for a specific communications protocol. Be sure the scanner you are using suits the protocol of your car. J1939 Can Bus--The connector should have metallic contacts in pins 4, 5, 6, 14, and 16. If your vehicle has this style connector, but doesnÃÂ¢Ã¯Â¿Â½Ã¯Â¿Â½t have these pins populated, you probably have a pre-OBDII vehicle. To add some confusion, even having the connector with the contacts shown above is not a guarantee of OBD II compliance. This style connector has been seen on some pre-1996 vehicles which were not OBD II compliant.